The Supreme Court grants oral arguments to about 80 cases a year. They decide another 50 without hearing oral arguments. By contrast, the Circuit Courts in the United States handled 51,832 in the year that ended on March 31, 2018 (that is down from 59,040 the previous year). The Circuit Courts, not the Supreme Court, have the final word on 99.75% of all cases. Republicans may have confirmed 26 Circuit Court judges under Trump, but they still have a ways to go to get parity in control of Circuit Courts. As of today, the picture above shows the breakdown by Circuit. 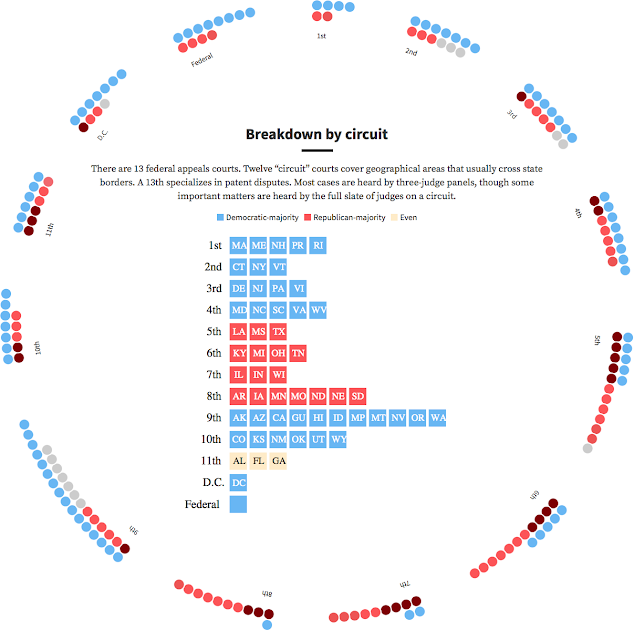 Three other nominees have cleared the Senate Judiciary Committee, but even when those nominees are confirmed, the Democrats will still control the Second, Third, and Ninth Circuits. So far 62% of Trump's appointees have been confirmed are merely replacing Republicans who are retiring. Five of the Democrats on the Ninth Circuit are over 70 years of age, but Trump would have to replace all the current vacancies and have four of these five judges over 70 retire for the Republicans to take a one-seat majority on that Circuit. 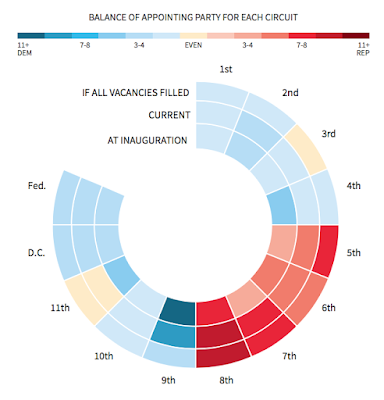 If Trump were to fill all existing vacancies, the only circuit that he could move from Democrat control to a tie would be the Third Circuit. There is no Circuit that he could flip from Democrat to Republican control during Trump's first term. 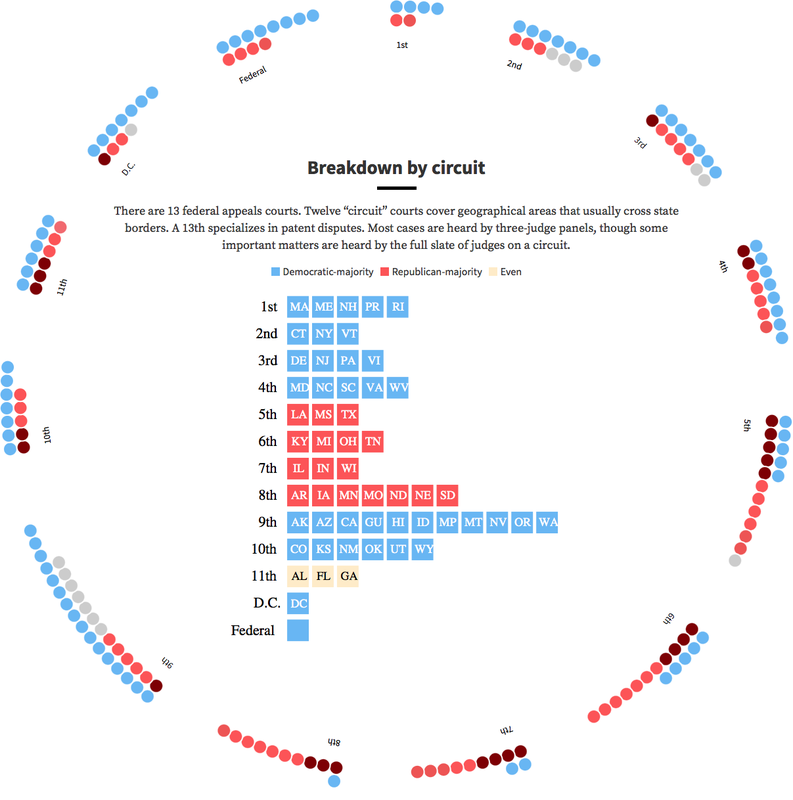 Nine Circuit Court judges nominated by Democrats are over 75 years of age. These likely retirements over the next 6 years could flip the Fourth Circuit. Some more information is available here and here. What would it take to split the Ninth Circuit into two separate courts?